It’s no secret that food security is becoming a critical issue around the world. With drought, economic instability, erratic weather and interruptions in transportation a very real threat, it really doesn’t take much to have the food supply disrupted. We’re certainly not immune to these effects in the West, especially since we rely heavily on corporate farming and mega supermarkets. Add to this population growth and the ecological toll of conventional, large-scale food production, and we have a seriously unsustainable system in place — one that could topple at any time. The drought in California, USA is a perfect example, where entire almond orchards and other crops have been laid to dust. But it’s not all doom and gloom. As the famous proverb says: “Necessity is the mother of invention.” Taking this proverb and running with it, a team of innovators from Quebec, Canada have developed an eco-friendly and exceptionally cost-effective solution to our food woes — the greenhouse of the future. 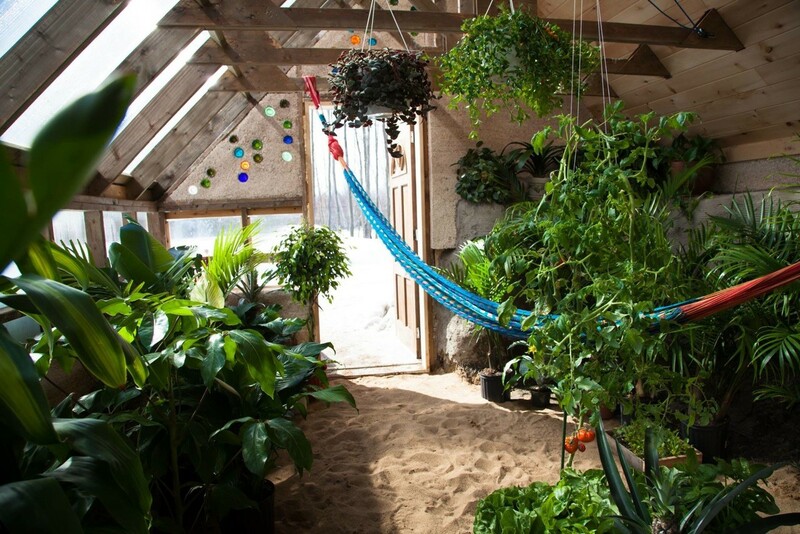 During a certification course at Earthship Academy, a seed was planted in the mind of Francis Gendron for a different kind of greenhouse. A turning point, Gendron realized our current food system is no longer sustainable and that we need creative solutions — quickly. Combining the principles of Earthships, aquaponics and passive solar greenhouses, Gendron — along with friends, Christian Désilets and Curt Close — designed and built a radically different food growing system. Not wholly surprising, they christened it The Greenhouse of the Future. Largely utilizing easy to find recycled materials, the team set out to build a greenhouse that would grow organic produce in any climate, while also providing a space for people to connect with nature and relax in warmth during the frigid winter months. Their main focus was to create a micro-climate for producing an abundance of food with minimal energy usage and low construction cost. The greenhouse is designed so that it’s partially dug into the ground to take advantage of the earth’s insulating properties. Recycled tires are filled with soil and used for the walls to further help regulate the indoor temperature. When prepared in this manner, the tires absorb heat during the day and then release it at night. In addition, earth tubes are used throughout to heat the interior during the winter and cool it during warmer weather. Solar panels can be installed as well for a completely off-grid structure. 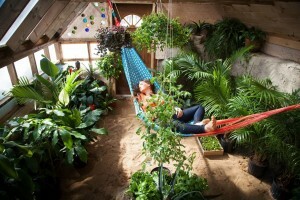 Positioning of the greenhouse is crucial. In the northern hemisphere, the clear polycarbonate frontside faces southward to make the most of the sunlight. Situating the greenhouse in this way also puts into service the insulated roof — during the winter months, the roof reflects light towards the plants, whereas in summertime, it helps to protect the crops from extreme temperatures. What’s more, the greenhouse utilizes a passive rainwater collection system. Gutters in the roof funnel rain into collection barrels within the greenhouse. Not only does this provide water for the plants, but also increases thermal mass, furthering the regulation of temperature. Aesthetic features include attractive glass bricks pieced together from recycled bottles, cedar siding and a DIY polycarbonate door. “Greenhouse of the Future — Abundance and Energy Autonomy” Francis Gendron, Christian Désilets, Curt Close, Frédéric Wiper, Marie-Soleil Martel.